My latest effort to entertain the quats was a dismal failure. I ordered a book called Boredom Busters for Cats: 40 Whisker-Twitching Games and Adventures. Here I learned about a new thing. Did you know that they make catnip-scented bubbles that are safe and non-toxic for pussycats? When I read that, I said "I gotta get me some of those!" I immediately hopped online and found some being sold through Amazon. Once the postage was tacked on, it was kind of expensive (about $7.50 for the one little bottle! ), but my thinking was, "The quats are gonna love this!" and anything that could help cheer them up was worth it. I felt like a schoolkid again waiting for the bubbles to arrive. And last night, arrive they did. So many layers of packaging I had to rip through! Once I got the bottle open, I put it down in front of Pandy Bear's nose to give him a hit. He sniffed with mild interest. Pandy bear watched -- then got up and walked away. I blew bubbles at Pooky sitting in the doorway. Whitey came along and I blew bubbles at him. Next I tried Honey. I could tell that her first instinct was to run, but she was intrigued enough to watch as the bubbles floated down at her. One of them lighted right in front of her and sat there wobbling. As she put her nose to it, it burst -- and that was it. ZOOOOM! Scratch one cat. I followed after her saying "Honey, it's supposed to be fun!" -- but every time I raised the wand to my mouth she got a terrified look on her face and ran away from me. Patchy almost was into it. But somehow Whitey's and Honey's fear transmitted itself to her, and she started retreating, too. I tried Pandy Bear again. He got up and walked away. I tried Pooky again. She gave me a look that said, "Cut it out with the damn bubbles or I'll poop on your chair." 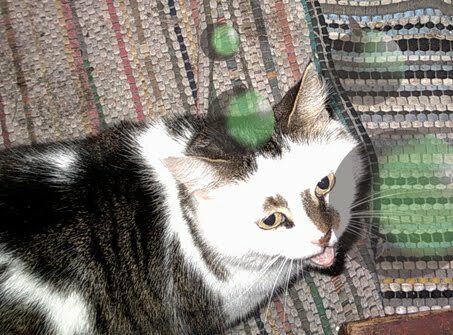 *Sigh* So much for catnip-scented bubbles. It seemed like such a good idea at the time. . .